Renfrewshire's title-winning squad. Picture by courtesy of Jean MacIntyre. 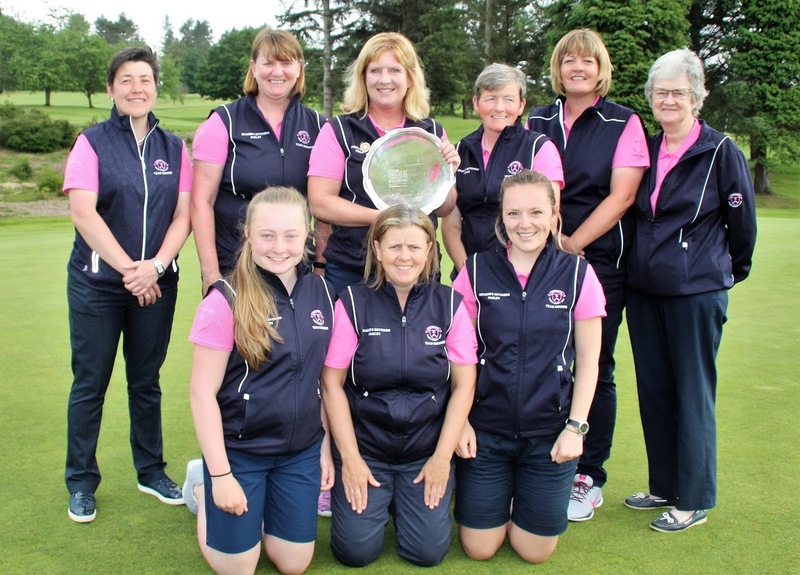 Renfrewshire booked a place in the Scottish women's county finals at Glenbervie from September 15 to 17 by winning the West Division inter-county team championship at Hamilton Golf Club today. Megan Briggs and Carol Whyte bt Lori McDonald and Fiona Rattray 3 and 1. Gillian Kyle and Jennifer Rankine bt Laura McGeachy and Lorna McClymont 2 and 1. Donna Jackson and Liz Stewart lost to Caroline King and Anne Laing 2 and 1. Briggs bt Rattray 4 and 3. Kyle lost to McClymont 2 and 1. Rankine bt Laing 2 and 1. Whyte bt McGeachy 3 and 1. Alyson McGinnigle lost to McDonald 7 and 6.